Michael Rex spoofs Margaret Wise Brown’s classic children’s book Goodnight Moon with his new creation: Goodnight Goon. Fresh Hobbit news straight from New Zealand: For a while it looked like New Line Cinemas and Peter Jackson were unable to iron out their differences and that the filming of The Hobbit would be entrusted into someone else’s hands. But today Jackson and and Hollywood studios New Line Cinema and Metro-Goldwyn-Mayer Studios announced that they had resolved their legal dispute. Jackson and partner Fran Walsh will serve as executive producers on not one but two (?) Hobbit movies. Pre-production will begin as soon as possible and both will be shot simultaneously, tentatively in 2009. The Hobbit is likely to be released in 2010 and the sequel in 2011. Jackson sued New Line in 2005 for unpaid profits, estimated to be about US$100 million, from the Lord of the Rings trilogy, which became a stumbling block to his being involved in The Hobbit. A decision still has to be made on who will direct the films, who will be cast and where they will be filmed. This is great news. Jackson did such a great job with the Lord of the Rings movies that I was really not happy with the idea of someone else taking over for The Hobbit. I am intrigued by the mention of two Hobbit films in the announcement. I assume that means they will film the book in two parts. So, Tolkien fans, what do you think? Update: According to this press release at TheOneRing.net, it looks like the second movie will be a sequel to the Hobbit rather than just the second half of the book. The Hobbit, by JRR Tolkien, was published in 1937, and tells the story of Bilbo Baggins before the events of The Lord of the Rings. It relates how Bilbo met the wizard Gandalf, fought Smaug the dragon, and found the One Ring. The Lord of the Rings trilogy has made about US$3 billion at the box office and another US$1 billion in DVD sales. Between them, the films won 17 Oscars. The new J.R.R. 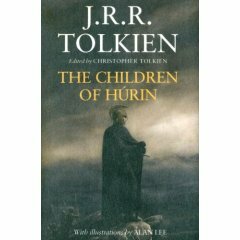 Tolkien book, The Children of Hurin, was released yesterday. Six thousand years before the Fellowship of the Ring, long before anyone had even seen a Hobbit, the elves and men of Middle-earth quaked at the power of the dark lord Morgoth. Hunted by easterlings and orcs, they fled to the fastness of Nargothrond and to the deep forests of Brethil and Doriath. Among them, a hero emerged. Strong and courageous he was, but foolhardy and impetuous. His name was Turin, son of Hurin. The Lord of the Rings works rank up there as some of my favorite books and movies, so I am excited about this one. I am curious how many Hobbit and Lord of the Rings fans out there plan on getting this.